Mentoring new writers is one of my passions, and I’ve been lucky to teach lots of writers through formal and informal mentorships, workshops, and seminars over the years. However, one of my frustrations has always been the limited timeframes. Writing novels takes time, which requires a true mentorship to last longer than a few weeks or a couple of months. Luckily, the great people at Writing Workshops Dallas are always looking for new ways to serve the writing community. So when I came to them and said I wanted to try this, they were enthusiastic about the opportunities it presented. Our interactions will include a monthly seminar on writing craft, one-on-one sessions to discuss challenges and opportunities, monthly critique of submitted manuscript pages, and a private online portal to foster a community of support during the process. Monthly workshops will meet at The Drawing Board in Richardson, TX. One-on-ones will happen over Skype. Time Commitment: Six months. Monthly 3-hour seminar. Monthly one-on-one Skype call (approx 30 mins). An hour or so a month to chat in discussion group. And, of course, writing time. For the full scoop, check out the application page here. Do I have to live in Dallas to be a mentee? Not at all. Students outside the Dallas/Ft. Worth area, or those who have limited mobility, can work remotely via livestream and Skype. Will I get a book contract at the end of six months? Writing novels is not a get-rich-quick endeavor. Anyone who promises fame or a fat contract to you is not to be trusted. Results depend on both the quality of information you receive from Jaye AND the amount of work you’re willing to put into this. Even if both of those things work out, no one can guarantee that the publishing market will be ready for you project when you’re done with it. Even if you can’t sell this project, you will have a toolbox and experience you can draw on for the next book and all of the ones after that. Why is Jaye the mentor for me? She might not be. Hopefully you’ll do your homework before applying. Read her writing posts here, follow her on Twitter, read her books. If she seems like someone you’ll get along with, then apply. If not, keep working hard or find someone who does seem like a great fit. You deserve to work with someone who supports you and gets your work. What if I can’t do it this round? There will be other opportunities in the future. At this point, we don’t know if the mentorships will be once or twice a year, but keep an eye on Jaye’s social media or join her newsletter for updates. Someone asked me on Twitter for my famous drunk cherries recipe. I use these for my Old Fashioneds, but they’re also great with ice cream or other desserts. These also make excellent gifts. Just make up a big batch, jar them, and put a fun label on them. Enjoy! Bring sugar, water, lemon juice, and spices to a boil in a medium saucepan. Reduce heat to maintain a simmer and cook until the mixture is slightly reduced and thickened, about 10 minutes. Turn off the heat. Stir in the brandy and the pitted cherries. Using slotted spoon, transfer the cherries to a 1-quart jar. Pour enough of the cooking liquid over the cherriesto cover them completely. Twist on lid. To preserve: Process the lidded jars in boiling water for 10 minutes, let cool, and store in a cool, dark place (such as a cupboard) for at least 6 weeks before using. Once opened, keep chilled. To celebrate Valentine’s Day, The Art of Loving a Vampire is a Kindle Countdown Deal until Feb. 14. Get it now for just $.99! Curator Sydney Worth has an embarrassing crush on the handsome kilted man in her favorite painting. The portrait is more than two hundred years old, so the last thing she expects is for him to walk into her museum. Logan, the eldest son of the Murdoch vampire clan, can’t understand why this stubborn mortal woman isn’t falling for his mind control. Left with no other choice, he agrees to work with Sydney to prove his family’s claim to the painting. Now he just has to figure out how to keep the very attractive curator from finding out he and his entire family are immortals. Can a vampire who hates complications and a curator with trust issues learn the fine art of love? Get it now on Kindle! Enter to win all five now! Volatile Bonds was nominated by RT Book Reviews for the Best Indie Urban Fantasy Award of 2017! I am so excited and honored to nominated. RT Book Reviews has been incredibly supportive of my books, and the fact that my first big indie book was nominated is thrilling. DIRTY DEALS LEAD TO DEADLY ENDS. Read the first chapter of Volatile Bonds now! 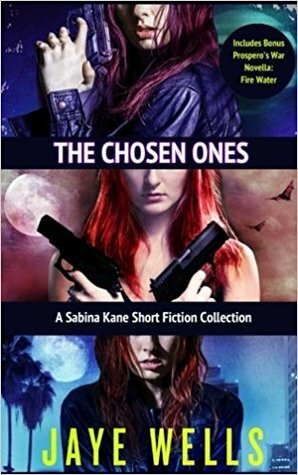 Sabina Kane fans (especially overseas) have been asking me for a long time when they could get all of her extra stories in one place. Well, today’s the day. Last year, I released a print-only edition of this collection, but now I’m able to offer it to you in ebook, as well. As a bonus, I’m including the first Kate Prospero novella, FIRE WATER, which is a prequel story that tells about one of her early cases as a rookie cop. If you haven’t tried the Prospero’s War series this is a great way to test-drive it before you commit. All in all, you’ll get two Sabina Kane novellas (Rusted Veins and Fool’s Gold), a Sabina Kane short story (Violet Tendencies), as well as a Prospero’s War novellas (Fire Water) for less than $4. If you bought each of these as separate ebooks it would be almost three times as expensive. Buy The Choses Ones in ebook now! Also available in print from most online retailers. I’ve spoken many times about how important writing is to my writing process. I finally put together a list of my go-to songs when I need to knock out a lot of words. Some of these will get traded for others as I tired, but several of them have been on heavy rotation for a decade because they always help me get in The Zone. Enjoy! 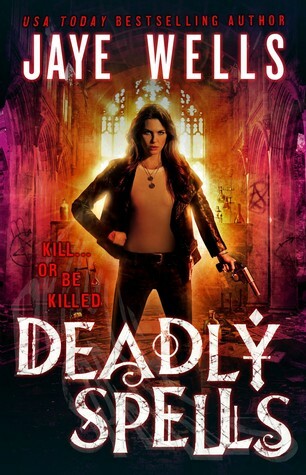 With only three weeks to go until Volatile Bonds releases, I’m giving away a signed copy of Deadly Spells (Prospero’s War 3) on Goodreads. While you’re there, go ahead and add Volatile Bonds to you “to read” list. You’re not going to want to miss it. “Wells continues to be an outstanding storyteller, whose characters are always complicated and truly unforgettable.” –RT Book Reviews, 4.5 Stars, Top Pick! Giveaway ends August 31, 2017. Giveaway ends August 21, 2017.